Craving your favorite Chinese take-out but looking to cut back on calories? Spiralized sweet potatoes are a great accompaniment to cashew chicken, making for a light and healthier alternative to noodles or rice. I especially love this dish for a quick weeknight meal that can be made in about half an hour, while dirtying only one skillet. The chicken is lightly tossed in a savory spiced hoisin sauce, and spooned over the tender noodles for a filling, healthy dinner. This recipe is high in protein and low in carbs, perfect for Whole 30 or paleo diets. Use your Mealthy SpiraSlicer to make delicious sweet potato noodles to replace traditional wheat or rice noodles. This both adds nutrients and lowers your carbohydrate intake. You can also try another firm vegetable to make noodles, such as zucchini, butternut squash or carrots. Per Serving: 758 calories; 49g fat; 40.2g carbohydrates; 40g protein; 102mg cholesterol; 907mg sodium. 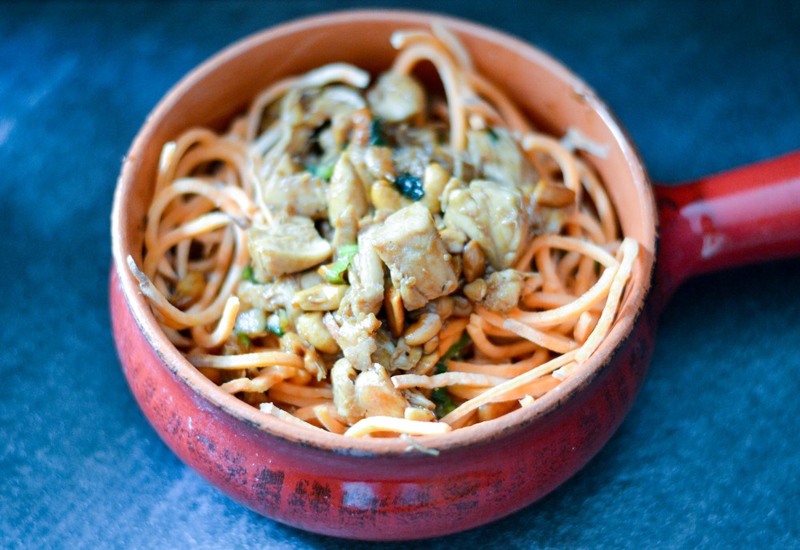 I put the slow cooker Thai Chicken (also from this site) over the sweet potato noodles here and it was so tasty. Delish!! I love sweet potato noodles! I can't wait to try this recipe but I will probably use tofu or seitan. This was my first time making cashew chicken and it was so delicious. Who would have thought that sweet potatoes are the perfect noodle alternative? Such a great dish! This was really delicious. I used zucchini instead of sweet potato, but other than that made no adjustments. I love how easy it was to make and plan to get a lot more use out of my spiralizer.